Take note: The road from Arusha to Lodoare Entrance Gate is 160km long. As of recently, the entire journey is on tarmac and it takes about two hours. Unless you stay on the main roads, which are graveled, a 4x4 vehicle is essential when entering the Ngorongoro Conservation Area and the Serengeti National Park. Witness thousands of pink flamingoes preening and reflecting in the still waters - a fantastic sight. These long grasslands are where thousands of wildebeest, zebra and buffalo roam. this is a particularly good area to witness lions hunting buffalo. There are usually up to 100 lions and 400 or more spotted hyenas on the Crater floor, the densest population of large predators in the world. 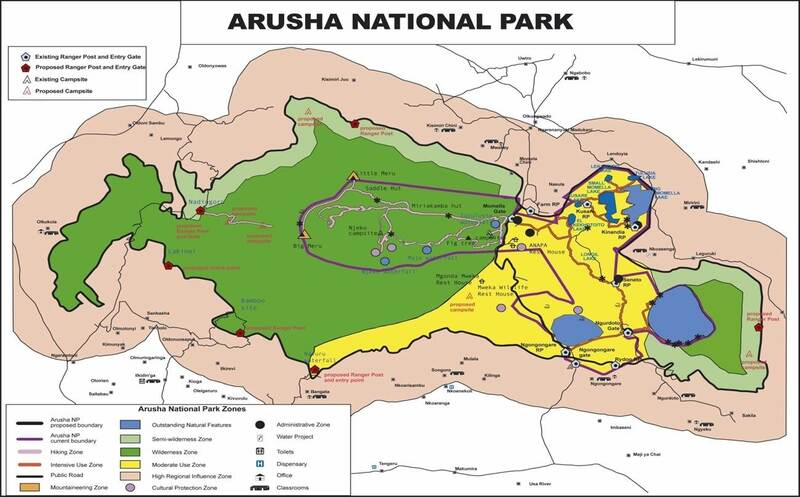 Arusha National Park (ANAPA) is a gem of varied ecosystems and spectacular views of Mt. Meru, the crater that gives the region its name. It is a popular destination for day trip visitors who are about to embark from the town of Arusha on longer northern circuit safaris. The small national park includes the slopes, summit, and ash cone of Mt. Meru, the Momela Lakes, Ngurdoto Crater, and the lush highland forests that blanket its lower slopes. The closest national park to Arusha town – northern Tanzania's safari capital – Arusha National Park is a multi-faceted jewel, often overlooked by safari goers, despite offering the opportunity to explore a beguiling diversity of habitats within a few hours. When choosing a safari operator, be sure to specify what kind of safari you want. Trips can be tailor made according to your travel preferences, the time of year, and what you want to see, so don’t hesitate to let your operator know exactly what you want. Game drives are the most important part of a wildlife safari. Game drives can be long, hot, dusty and bumpy. There are several types of Standard Game Drives, which are listed below. With a tailor-made safari and your own vehicle, you are able to choose the types and durations of the game drives you go on. An Early Morning Game Drive starts just before dawn at around 6 am and normally finishes by 8:30 am when you return for breakfast. Virtually all lodges and camps will have tea, coffee and biscuits etc. available from around 5:30 am, so you can partake of a little light refreshment before you go. A Morning Game Drive usually starts after breakfast at around 7:30 am and finishes in time for lunch at around 12:30. A Late Morning Game Drive is usually done in tandem with an Early Morning Game Drive and starts between 10 and 11 am, returning for lunch at around 12:30. An Afternoon Game Drive usually starts around 4 pm, returning before dark between 6 pm and 6:30 pm. An En-Route Game Drive usually takes place in the morning or late afternoon and as the name suggests, is performed en-route to a lodge or camp etc. The duration can vary wildly depending upon the journey undertaken, and can even be just the short drive from the lodge or camp to the park exit and vice versa. 1-day Arusha National Park safaris, tours, travel and other trekking packages was designed to offer visitors, with a free day on hand, a choice between three different (Arusha, Lake Manyara or Tarangire) 1-day wildlife safaris or tours. Non game-viewing travel time: 1 hour/ Distance: 60 km After breakfast you are met by our professional tour guide/driver, who will deliver a short safari info briefing, after which we travel east to the Arusha National Park. This small but beautiful Tanzanian National Park is the closest national park to both the famous Arusha “safari town”(40 km) as well as the Kilimanjaro International Airport, thus making it ideal for 1-day safaris or tours. We will enjoy a picnic lunch inside the park and do a morning and afternoon game drive, visiting both the Momela Lakes and the Ngurdoto Crater. Wildlife which could be seen include African buffalos, elephants, hippos, giraffe, warthogs, antelopes, zebras, blue monkeys and sometimes a rare leopard or hyena. Late afternoon we depart for Arusha where we will end our safari adventure. The group should tip the tours guide around $ 20 to $ 30 for the day. You will be taken to your hotel, which ends our tour package services. Our 2-day Lake Manyara & Ngorongoro Crater safari packages were designed to offer visitors, with a time constraint, a short but a very intense Tanzanian Northern Circuit wildlife safari experience. Please note that there is no accommodation available inside the Ngorongoro Crater National Park. Non game-viewing travel time: 2 ½ hours/ Distance: 130 km * Dinner and overnight as per the standard and type of accommodation option requested. * The departure dates for all our African safaris and tours, packages are totally flexible according to your own personal needs. Please contact us for further and more detailed info on safaris, tours and travel packages into Tanzania. The Serengeti ecosystem is one of the oldest on earth. The essential features of climate, vegetation and fauna have barely changed in the past million years. Early man himself made an appearance in Olduvai Gorge about two million years ago. Some patterns of life, death, adaptation and migration are as old as the hills themselves. The Serengeti region encompasses the Serengeti National Park itself, the Ngorongoro Conservation Area, Maswa Game Reserve, the Loliondo, Grumeti and Ikorongo Controlled Areas and the Maasai Mara National Reserve in Kenya. Over 90,000 tourists visit the Park each year. At 5896m Mt Kilimanjaro, Africa's highest mountain and one of the continent's magnificent sights, It has three main volcanic peaks, Kibo, Mawenzi, and Shira. The name itself "Kilimanjaro" is a mystery wreathed in clouds. It might mean Mountain of Light, Mountain of Greatness or Mountain of Caravans. Kilimanjaro is one of the world’s most accessible high summits, a beacon for visitors from around the world. Most climbers reach the crater rim with little more than a walking stick, proper clothing and determination. And those who reach Uhuru Point, the actual summit, or Gillman’s Point on the lip of the crater, will have earned their climbing certificates. And their memories. The Umbwe route is known for its caves. The first night you actually sleep at the Umbwe Cave Camp with two more caves that can be visited en route the following day. The Umbwe route is one of the shortest routes to the Southern Glaciers and the Western Breach. It is probably one of the most scenic, non-technical routes on Kilimanjaro. The Shira Plateau is one of the most scenic and most fascinating areas on Kilimanjaro. Depending on the weather conditions you can drive by 4 wheel drive vehicles, to within a 1/2 hours walk of Shira Hut (4000m). Even this drive is very spectacular indeed and offers some magnificent views of Mt Meru and the Great Rift Valley in general. 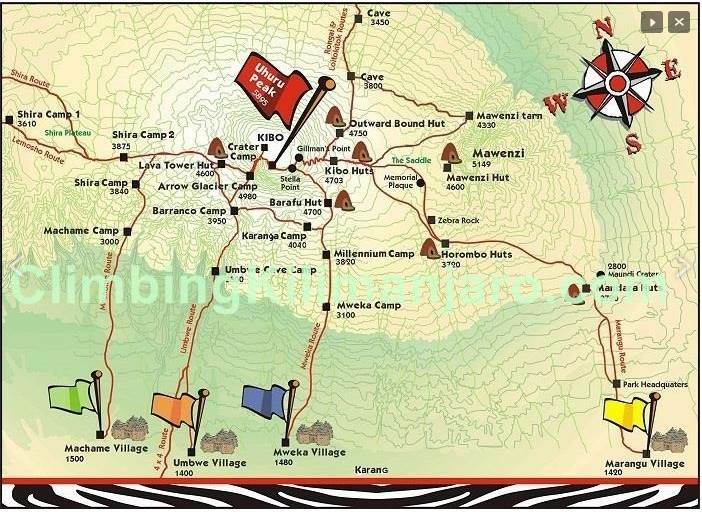 The Shira route is only offered to hikers who are already acclimatized to 4 000m, by hiking either Mt Meru or Mt Kenya a few days before attempting Kilimanjaro. HOW TO GO TO Zanzibar Island From ARUSHA? HOW TO GO TO Zanzibar Island From Dar Es Salaam ?